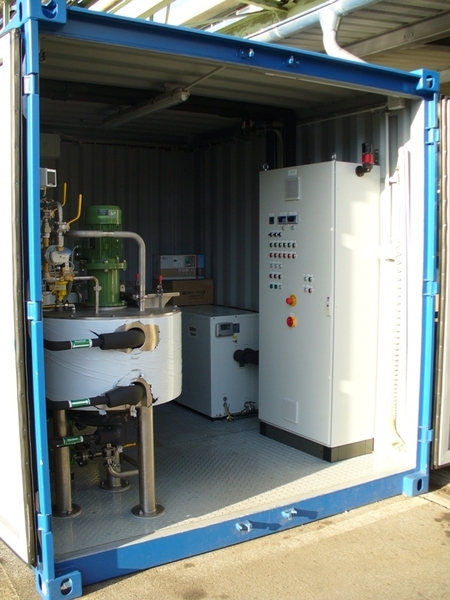 In December 2011, TESIUM GmbH supplied a dispersing plant for nanoscale iron to Toda Kogyo Europe GmbH. Toda Kogyo has specific know-how in the manufacture of Reactive Nanoscale Iron composite Particles (RNIP) that are used for the reclamation of contaminated ground that, for example, are contaminated with chlorinated hydrocarbons. In June 2011, TESIUM received the order to design and construct a compact dispersing plant for Toda Kogyo that can be transported by lorry to the respective location of use in Europe. Based on the present operating experience of the customer and their process description, TESIUM designed the plant with dispersing tank, buffer tank, dispersing mill and cooling in a 10 foot container. Also the control unit design and switching cabinet construction was carried out by one source. The result was a robust plant module for field operation that took into consideration all the relevant EU standards. Within the framework of the works acceptance, Dr. Ulrich Koemm, Managing Director of Toda Kogyo Germany, was impressed by the compact and functional conception of the plant. In December, in close cooperation with technical staff of the Japanese headquarters of Toda Kogyo Corp., Hiroshima, TESIUM supported the commissioning at the customers' premises. "We have seldom experienced such a smooth initial operation of a plant", according to Dr. Ulrich Koemm. "Also during the subsequent tests with the product, the dispersing plant satisfied all requirements." The plant is now ready for use in reclamation projects in Europe. Thereby, the liquid suspension produced from nanoiron particles are injected into the contaminated ground. The highly reactive nanoiron particles (RNIP = reactive nanoscale iron composite particles) can destroy chlorinated hydrocarbons and also the otherwise scarcely degradable halogenated hydrocarbons. Using this technology, heavy metal compounds can be precipitated or reduced. Iron is a normal part of the ground and is completely non-toxic. Thus, contaminants and their contamination plumes in the ground and ground water can be removed efficiently and without further additional contamination.